who apparently think we're trying to get away with something. sense of humor." read more..
"VM's "B.S." Levy, Charles Camp Win Bevy of Racing Writer Awards" read more..
"…recalls to mind Catcher in the Rye and Holden Caulfield…"
" What will grab you about this novel is the voice of its hero, Buddy Palumbo, a working class kid from Passaic who falls in love with cars and the boss's niece (in that order). He is a living, breathing reality from the first paragraph, with a style that is tough, funny and down to earth…Structurally, this book is a lot like opera--Buddy's growing up is the recitative between the races that are the impassioned arias. Even people like me, who don't much care about cars and racing, can understand the obsession by the time they've finished reading…." "I love this book. It's a wonderful story, and the accuracy of the details is amazing!" "…the first book I that I ever found impossible to put down…Levy paints a Technicolor picture of the thrill and danger and camaraderie of American road racing in the early 1950s." "A hilarious story of greasy fingernails, hot oil, fast laps, cross-country adventures, all-night wrenching marathons, and first loves...The best written novel of sports car racing ever published!" "...transports the reader to the summer of 1952. 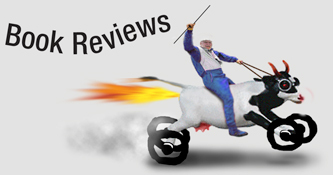 The Last Open Road is the funniest racing novel yet written!" "I got such a kick out of it! Evokes the ambience of those days with great skill, sensitivity and insight." "Incredible characters leading us on one hilarious adventure after another...'beater' Fords, crew cuts, underage drinking bouts, fights with Dad, and falling in love with both women and sports cars. You'll enjoy every single page." "Open road racing in the fifties described so authentically you could be there. Wonderful!" "Page after page of rip-roaring yarns. Levy has the impressive talent of spinning a story so interesting, so factual, and so utterly hilarious that one can't help being engulfed in each moment." "Good fictional books about automotive topics are rare, but Burt Levy's The Last Open Road is an exception...uses exquisite detail to capture the time when sports cars were playthings of the wealthy." "It's good to finally see some honest truth about racing. 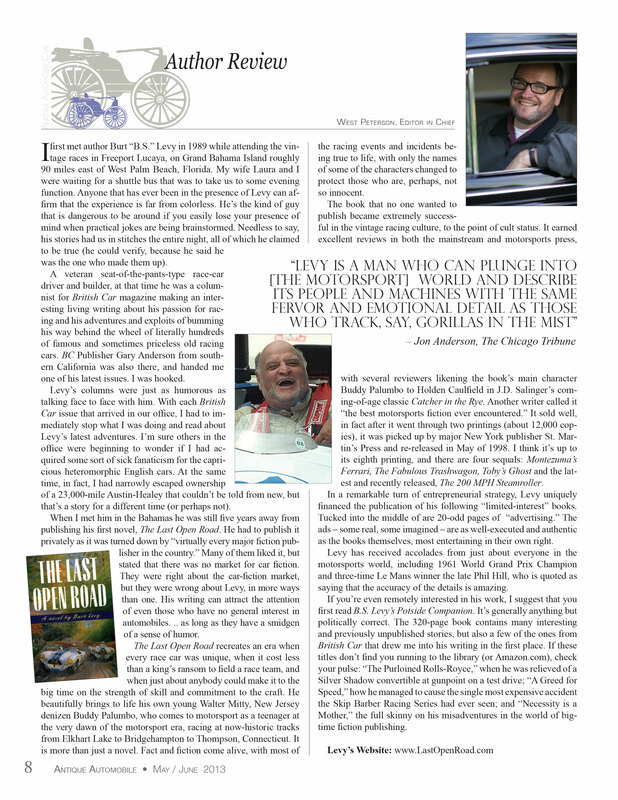 "The Last Open Road is a gem...a terrific job of research results in very evocative descriptions of the cars and the race action. Deserves to sell in droves." "If you are sixty or older, buy this book for the memories it will trigger. If you are younger, buy it for the incredible experiences you missed." 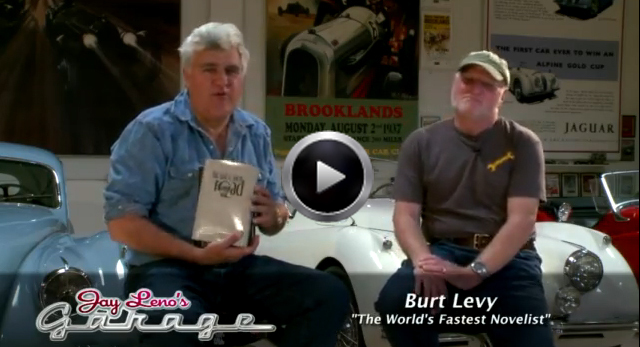 "Not just the best car book I've ever read, but one of the best books I've ever read, period!" "...calls to us with the lure of open roads long gone and images of coming of age in the Eisenhower era and boundless horizons in every sense...Levy captures the excitement, adventure, and fun...providing entertaining backdrops and eccentric characters throughout." "...a masterly job of capturing the spirit and adventure of that time of innocence." "For those bitten by the bug of this roaring sport...Levy is a man who can plunge into their world and describe its people and machines with the same fervor and emotional detail as those who track, say, gorillas in the mist...Could this become a sort of Wrenches of Madison County?" "Anyone who ever put a wrench on a sparkplug will fall desperately in love with this story!"